Results-oriented sounds so buzzwordy (is that a word?!) I hesitate to use it. But I think asking yourself why you want to include social media in your marketing mix is useful in designing your strategy. Social presence. I hear that a lot. I’m not sure the term works for me though. It sounds flimsy, like sticking your business card on the grocery store cork board with a pushpin. There you are. See? That’s why “presence” just isn’t enough. And, it’s also why I’m flipping this social media marketing how-to follow up post around and throwing out the evocative question, “Why?” instead. Yeah, yeah, I know, you want a social media presence but still I ask, why? Showing up in the first place, I suppose, supports the “presence” part and, I guess we can include the visibility in your marketplace from social as presence. But again, big deal. Just sitting there, pumping out the company line or promoting all-you-all-the-time (Hint: if you don’t think this is you, check your feed…) isn’t cutting it. Not even close! Being “visible” by offering a social media “presence” in this way is being a ghost. There’s no meaningful exchange, only a vision of something there. Stagnantly sitting there. I feel dull even talking about it. I don’t know about you—whether you’re big, small, a solo flyer, or a man you ought to see that one conglomerate—but, please I ask you, give your social media approach a heartbeat. At least! I know asking for a personality on top of everything else may be driving you right over the edge, but think about this, okay? Because, if you take a results-driven approach, your goals for your social media marketing strategy involve connecting, communicating, even converting. Oh, my. These are much deeper results than a mere presence can ever deliver, right? Create. Curate. Converse. Okay, okay, so I stole these groovy words from this hippie marketing guy. His name is Tad Hargrave and he turns out to be this incredibility intellectual hippie marketing guy. The topic of a recent webinar was niching and in it, Tad talks about how you need to find your role in the larger community to determine where you fit in or how you belong. Of course, social channels are integral to this process, particularly for digital businesses. Tad says all marketing revolves around what you create, curate, and the conversations you have in business. Hmmm. You know, he may have a tremendous point in this, the more I mull it over. For example, even in my local boutique biz, the create, curate, and conversate focus absolutely applies. I curate, for example, when I subcontract with a partner business and provide an additional service to my clients. I’m handling their extra need or needs for them professionally. Even if those needs are outside of my direct expertise. When I create and deliver something beyond what a client expects from my product or service, I am marketing via what I create. Growing a business happens when you deliver on and exceed expectations in providing a product or service.Click To Tweet So, creating a solid product definitely falls under good marketing. Finally, you’ll find your customers give you the best marketing panache of all and you’ll learn more about yourself and your business by listening to what they have to say. So this is how conversation is bigger than big in your marketing machine. But remember, the listening side of having a conversation tells you quite a bit, so please don’t forget to listen closely. Try to pick up on the unique themes you learn in those conversations, but also pay attention to the things that come up most. Hone in on your best assets, but don’t forget to listen for areas needing improvement and act on any flaws you find to make corrections. I think Tad’s three C’s for marketing set the perfect simple framework to guide your social strategy as well. Use them as a guideline to begin digging for the deeper value, reach, and the results you want by activating your SMM (social media marketing) plan. What you create, you amplify and promote by sharing. But try to edit yourself and only promote your best content. This is hard sometimes because sharing your content on your social feeds is how you test its value. On the other hand, amplifying and promoting your own content is only a portion of what you want to show on your social stream. Don’t be afraid to show a personal side occasionally. But if you’re doing social media for business purposes, then keep your posts business-like and on topic, for the most part. What you curate helps the people you interact with by being valuable vetted content you share with them, providing insights and resources. Go ahead and throw some thought-provoking content or something super interesting into the curation mix, even if you do stray from your usual topics. Aaron Orendorff threw something out a little while ago on his social media, for an example, that totally changed my mindset and helps me beyond words. If you know Aaron, you may think he’s a pretty fun and funny guy—along with having writing brilliance and all that—but he’s totally best at being human. If not for his hilarious and oh so thought-provoking hashtag (how social can it get?) #LetsGetRejected, I may not be writing this right now. Now that’s a connection. But people, if writer-the-world-over-Aaron has to pick himself up and keep on writing because it’s a tough game where your ideas, blood, sweat, and tears are always scrutinized, then why can’t I? I reached out to thank Aaron for saving me (from the nearest bridge) as I was about ready to quit writing and feeling quite distraught. But, with one of his usual gracious and human with a capital “H” replies, he generously uplifted me even more. Make sure to make yourself interesting and worth noticing. I cracked up laughing at Chris Brogan who pleads with folks to just quit being tofu on social media. The origin of this rant is that someone tweeted me a nice compliment. I realized that I’d seen the person’s name in my feed a few times in recent weeks, so I thought, “Hmmm, maybe I’ll give this person a follow and see what they’re all about. The “commentary” above each tweet are all generic and/or other people’s words. Being polite doesn’t hurt either, I find, so I thanked him for replying. But being polite doesn’t mean following everybody and their brother. You want real followers and real engagement and not just followers for followers sake. The first time I tweeted Chris was nearly two years ago, even before I subscribed to his smart newsletters, and guess what? He responded that time too. So, I know he walks the talk, while many at his level of notoriety simply tell you to do on social, what they themselves do not. Hmm. Don’t pay attention to follower counts, but to users’ tweets. When was the last time they tweeted? How many tweets did they tweet? What are they tweeting? If it’s the same thing over and over, you may want to run! Pay attention to subject matter. Is their feed a fountain of political spew and not a business site? Do they show more than one point of view? Do you want to hook up with a hater? I don’t. Look, if there’s no chance for engagement, no chance to connect, no chance ever to collaborate, help each other, or find business opportunities, then the numbers are, well, meaningless. When you share content for folks you admire, you start to build a rapport with them. Reading and curating their content becomes, in time, a bridge to connect with them further. Earning respect goes far better than proclaiming it, don’t you think? A good example is the DM’s (Direct Messages via Twitter) I receive. Most don’t seem to expect a reply so when you do reply, it ends there. Interesting. That’s NOT a conversation and hey, they (the DM-ers) started it. Out of all the DM’s I’ve received (too many) since I’ve been on Twitter, this one guy stands out. He says in his DM to feel free to ask him any question. So, of course, I did. And not only did Jason Iverson of sbwp answer me, he also helped me out. To top it all off, Jason and I had quite a few laughs during that interaction. His DM was from a person, a real one who responded and made me laugh. Perfect. Some people do DM and instantly make that expert proclamation. While they may very well be an expert, I believe it better when I learn about them and then know it to be true more so than when they just say so via an impersonal DM. Another favorite for me is the DM question. You answer. Interaction over. Well, that’s always fun, huh? Is that a conversation, I ask you? Did we actually connect in any way? These non-interactions, to me, seem insincere and like you’re just blowing smoke up my…well, you know. When you make connections with other sincere people, working for big companies or solo, you’ll find they are just like you, trying to do the best they can at their “thing,” whatever it is. Just like you! The best outcomes result in collaboration with the people you engage with on (not just connect) social media, and I promise, this happens in real life! At least to me—several times in fact. For these kinds of results, I feel gratitude for the opportunities generated from—OH MY I CAN’T BELIEVE I’M SAYING THIS—social media. On that note, look for a post 3 to examine how to intentionally dig into your social media marketing strategy as outlined in this download. If you missed the first post explaining three key things to think about before jumping in and doing SMM, you may have missed the comprehensive outline. 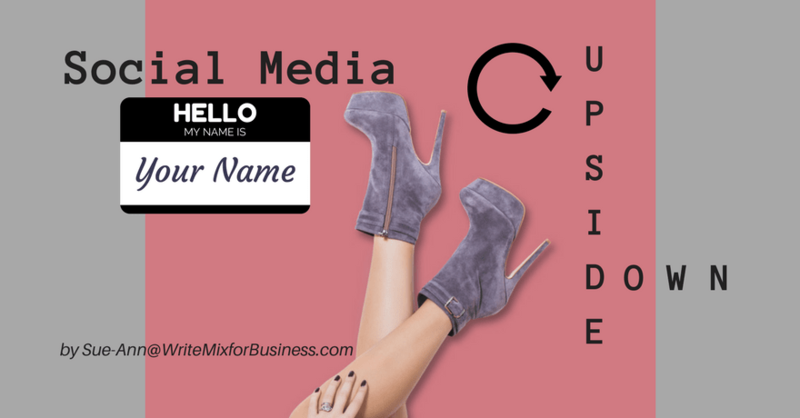 It was put together for you to create your social media marketing strategy from the ground up or to revise and update your plan depending on where you are now. Going through the outline will give you a great framework to get started, but importantly, it will help you do the thinking, research, and planning you need for a strong SMM strategy. Concentrating on relationships and not simply promoting yourself is the golden key to social. Until the next post, brush up on these podcasts collected by Shrisha Shetty in 25 Social Marketing Podcasts to Make You a Pro. Some of my favorites are on her list and you may find a favorite there too. Here’s one last piece of homework to make sure you are aligning your social media strategy to properly achieve measurable results. Remember “results-oriented” in the first sentence of this post? Great. Because in this post for Buffer by Alfred Lua, he describes the top reasons why businesses use social media and how to align the desired outcomes with the proper metrics to analyze your true results. Now that’s what I call looking at your social media upside down! Excellent Sue-Ann. Conversing is so easy and powerful on social. If you talk to people, thanking them, starting genuine chats, bonds form. Bonds that of course grow business in most cases. But it is about being genuinely interested in human beings; not in what they can do for you. Get that down and the sky is really the limit with social media, however you intend to use the platform. Thanks for checking this one out. I know you like Chris Brogan and I feel sure, like me, you don’t have to worry about being Tofu anytime soon! I recently read a post you wrote saying that building relationships on social media means being willing to give and I feel like I’m doing this right, over a long period of time. Because, by supporting and interacting with folks for a long time first, suddenly they began interacting with me, right back. Recently I was complimented by a couple folks I respect for how good I am at rising others and it truly makes me smile. This brings opportunities and often, a person you can contact with a question, or idea, or to share your stuff with, eventually. When that starts happening, it’s really great for you and for your business, alike. Nice Article, Sue-Ann Bubacz ,,,,,,,really social media is the best to engage the audience in todays world and you have shared right words in this article. Create. Curate. Converse , three words are aptly written in this write-up. Hopes more interesting article from you. It’s an awesome Article. I love reading Your Article. In your articles Each and every word is well written and you added very valueable infromation in your articles. You’re welcome. I’m not sure if it works as a “fast” solution but you can definitely get started fast enough with a few button clicks. The trick is making your social media marketing “meaningful” I think. Thanks for taking time to comment. Very catchy article!! Explained so beautifully. Liked the “Human Touch” aspect of Social Media, importance on proper engagement, making it lively etc.. Thank you for the lovely comment. Human, human, human…makes the work go around:) I think it’s true. I think I’m funny when I write sometimes so, I’m so pleased you felt it was explained well and understand how engagement is a cornerstone to content, in general, and social media as well! Another fantastic post Sue-Ann! I love reading them and got a great deal of helpful and friendly advice from this. Much appreciated. Well, mostly I think it has to do with the limited number of characters allowed when sharing on social streams. Yes, it may look nicer but mainly, you want to have more room to say something (important) rather than simply share a link and this allows an opportunity to do so. But, what I think you are mostly talking about in your comment comes down to management. For example, you do not want a Social Media Manager who is NOT level headed or to prevent human emotion from mucking things up (even from a level headed person) you can implement a check and balance system like a wait time or second approval to make sure you won’t have problems from an impulsive response. For client problems, social media and 140 characters often will NOT be the best way to handle and resolve situations but, in my next post I have a link to an article with examples of how some companies are alleviating a lot of customer service time and aggravation with shorter and faster response that their user (customer) base loves and is responding to. This saves them time and man hours and also elevates a positive p.r. publicly seen on social networks and offers real-time interaction with their audience. So again, I think the problems you are describing are management issues more so than problems with using Social Media Marketing. And, of course, you may choose NOT to use social media for your business or for one part of business like customer service. Anyway, next post will be more step by step starting with a look at your company and how to manage an SMM Strategy to meet business objectives and user needs at the same time. Possibly something useful for you to check out. thanks for your response, i believe that the two level approval system would be great. nonetheless, your reply was informative, as well as true. Management plays a key role to. thank you for your response. Social media is a big part of my marketing strategy. Create, Curate, Converse is definitely a principle i would like to systematize as part of my social media strategy. Thanks for sharing. Isn’t it just gold? I love the three “C’s” Approach and find it amazingly useful especially in the context of Social Media Marketing. This’s an awesome article. Social platforms become the most largest sources for website traffic and customer engagement. It is, however, not always working well for every business. As a man of CopyBlogger said, if you want to figure out “How”, you should ask “Why”. So, why do we want to integrate social media with out business activities? Yeah. It’s a million question. I love the 3Cs formular but not often implement that. Anyway, thanks for sharing the article. But further, if you can measure results by knowing what your content or social goals are, you can then know if what you are doing is, in fact, getting any traction or find hints for how to improve as you go. The three “C’s” for marketing that Tad talked about really resonated with me and is one of the reasons I took this post in a different direction than expected. But, I truly think it’s gold and we can ALL use it moving forward and upping our SMM game by considering this framework. I’m so pleased it resonates with you, as well. It makes the whole piece very worthwhile for me to feel it helps you!! Thanks for providing valuable information regarding social media. social media is the fastest way promote your business and you grab an opportunity in single mouse click. social media has become a better networking tool for corporate branding and marketing as it has bigger audience . Growing your audience and reach is most definitely an important component in SMM and so yes, it IS a networking tool…but, only if you “work it” to make it so, don’t you think? Thanks for commenting and take care. social media is the best way of marketing any business if used wisely. Keep sharing such useful article,you have put forward very valid points. It was fun reading it. Sue-Ann Bubacz would love you to read ..Are You Walking a Social Media Tightrope?